Hairsprings are miniscule. Generally no more than one centimeter in overall diameter when coiled, they are roughly 50 microns thick and 150 microns wide. Tiny they may be, but insignificant they are not. The hairspring, which has long played a vital role in the accuracy of timekeeping, has come a long way with various technological advances over its lifetime. The latest in that long line is the silicon hairspring. Here, I am going to compare the silicon hairspring with more traditional hairsprings currently used in watches, discussing its future and whether silicon is an improvement for today’s timekeepers. I won’t be covering all brands and types of silicon hairsprings here; I will specifically reference Rolex springs. Steel hairsprings were the first on the scene, but they had two drawbacks: the steel used was a ferrous metal that is easily and adversely affected by both magnetism and changes in temperature. To compensate for this, the bi-metallic temperature compensation balance was invented. When temperature rises, a steel hairspring expands in all dimensions, therefore decreasing the rate of the watch (making it slow). On the other hand, in cold weather the steel spring contracts, becoming smaller and increasing the rate, or speed, of the watch. To compensate for temperature changes affecting the steel hairspring, the balance wheel was made of a steel band on the inside overlaid with a brass band on the outside, leaving two cuts. Brass is not as adversely affected by temperature as steel, so the two metals worked together. With a rise in temperature, the cut ends of the balance curled inward, making the watch run faster and compensating for the spring making the watch run slower. With lower temperatures, the opposite was true: the cut ends curled outward, thus compensating for the spring’s increase in rate. With the introduction of this temperature-compensation balance, the effect in temperature change had been largely overcome. But one adverse issue remained: magnetism. Around the turn of the twentieth century watchmakers were introduced to Invar and Elinvar, compounds comprising iron, nickel, and chromium that were practically impervious to changes in temperature, possessing a near-zero thermal co-efficient and much less affected by magnetism. A further improvement arrived in the 1930s when the world was introduced to Nivarox, an even better compound based off Invar but with added chromium and the new addition of cobalt, though still containing ferrous metals. With the introduction of these new compounds, temperature compensation balances were a thing of the past. These new components were stronger, more technically advanced, wear resistant, corrosion resistant, and longer lasting – they were better in every way than previous hairsprings. A step in the right direction. Also one important point to note is that you will read a lot of information on the internet stating that Nivarox and Elinvar are non-magnetic, but this simply is not true. Both compounds still contain ferrous metals and are therefore still magnetic. However, the effect of magnetism was significantly minimized due to other compounds being added. However, the problem of magnetism still existed. In the year 2000 Rolex introduced the world to the Parachrom hairspring, a true technological advancement on the horological landscape. The Parachrom hairspring is a Rolex-patented alloy of niobium, zirconium, and oxygen. Rolex states on its website that the Parachrom hairspring presents major advantages for precision timekeeping: it is insensitive to magnetic fields, offers great stability in the face of temperature variations, and remains up to ten times more accurate than a traditional hairspring in case of shocks. Being insensitive to magnetic fields is fantastic, a huge step in the right direction for hairspring manufacturing, Rolex created a hairspring without the presence of ferrous metals, thereby eliminating the magnetism problem. Being stable during temperature variations is a good thing, but previous materials have achieved that just fine so at this stage we will focus on magnetism being the standout improvement. Claims of being “ten times more accurate than a traditional hairspring in case of shocks” is great, but at this stage we have no way of verifying that without Rolex showing us test results. But what we can conclude is that the Parachrom hairspring is truly a great innovation, technologically advanced, superior in every way to earlier hairsprings, and can be maintained well into the future. Well done, Rolex. So things were looking up for the humble hairspring, but in 2014 everything changed again. Silicon hairsprings have been around a lot longer than 2014: Ulysse Nardin was the first to introduce this amazing feat more than ten years before (see Looking Back On 10 Years Of Ulysse Nardin’s Pioneering InnoVision Technology). Though Rolex was part of the same Swiss research group, it took the Genevan giant a little longer to get on board. The Syloxi hairspring is a silicon and silicon-composite mix, designed to overcome some of the issues faced by a traditional hairspring, and it is currently being used in Caliber 2236, which made its debut in 2014 in a ladies’ watch (see Always Expect The Unexpected: Rolex Surprises Yet Again With The Oyster Perpetual Datejust Pearlmaster 34). The Syloxi hairspring makes many of the same claims as the Parachrom spring: it is ten times more accurate when exposed to shocks, impervious to magnetism, and offers greater stability when exposed to temperature variations. However, there is one way it stands over and above the Parachrom: gravity. 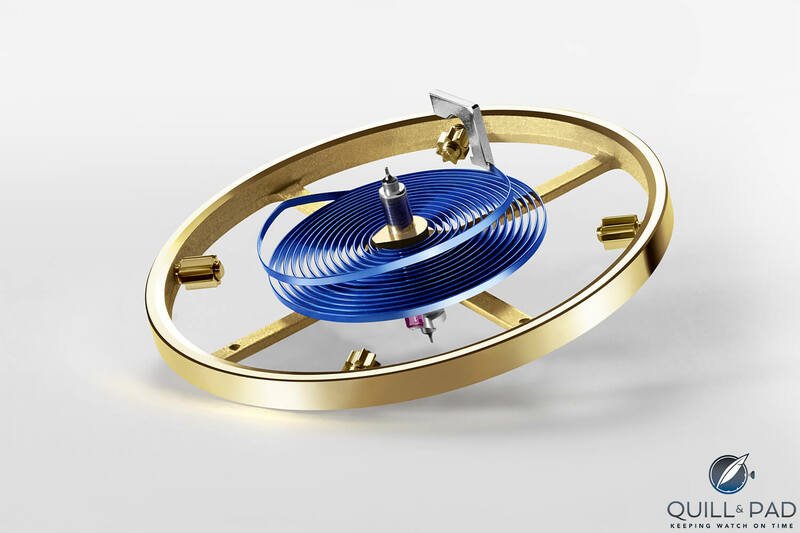 Rolex has a come up with a new way for the Syloxi hairspring to become more stable by changing the geometry to optimize the isochronism of the hairspring – which basically means that the balance will keep the same time regardless of amplitude. Factors that affect isochronism are the escapement, incorrect poising of balance and spring, play between the curb pins and the balance spring, centrifugal force, and magnetic fields. The Syloxi spring attaches to the balance staff in an entirely new way, without the need for a collet that has been pinned or glued, which enhances the flatness and concentricity of the spring. It attaches to the balance bridge via two fixed points as opposed to one on a traditional or Parachrom hairspring, making it more rigid, flat, and centered. So is silicon really better? I conclude that silicon hairsprings are tecnically better in every way. They are better timekeepers all around, less affected by external forces, and wear less over time. I have only one issue with silicon hairsprings: they require complex and expensive manufacturing techniques, making them limited in their lifespan. If a vintage watch with a hairspring in desperate need of repair or replacement comes to a competent watchmaker’s bench, it is something that can be tackled. He or she could manipulate that spring or perhaps cut, pin, and time a new one from scratch, thereby breathing new life into a classic piece. With silicon that currently isn’t possible. However, modern manufacturing is becoming less complicated, cheaper, and more accessible by the day. Perhaps 3D printers capable of printing new silicon balance springs in a matter of minutes will be standard in all watch restoration workshops in some foreseeable future? Silicon hairsprings are the way of the future, though. Of that I have no doubt. They do possess real benefits for watches today. Consumers demand more from everything, including watches, and the industry is listening. I was once a skeptic of silicon components, but having seen timekeeping results first hand I know they are here to stay. I am surprised that this article failed to mention the pioneering work done by Omega, Breguet and Blancpain. These houses have been using silicon hairsprings for more than a decade and today essentially all of their movements have silicon hairsprings. As well the article failed to speak about the huge chronomètry advantages. The hairsprings can be formed into idealized shapes…thicker where they need to be, thinner elsewhere. This allows them to expand and contract better than with standard materials. Indeed, the Breguet Chronométrie has two silicon hairsprings formed with stiff bridges in places to better center the remainder of the spring. Also silicon responds more uniformly to impulses as the barrel unwinds, yielding better isochronism performance. Congrats to Rolex for coming to the party a decade late. …by a Rolex-trained watchmaker? You forgot to add that part, Ian. The original consortium of the time (as well as the already mentioned Ulysee Nardin of course), which worked on silicon/silicium comprised Patek Philippe, Rolex and the Swatch Group. (This last information was published in local Swiss newspaper sources in Chaux de Fonds/Le Locle, but not watch mags of the period.) So of course Blancpain et.al. enjoyed the fruits of these endeavors, what else is new Jeff? Ulysse were the pioneers with silicon/silicium by far, after trying out diamond for spring production. I do not know of any reliable reports on the chronometric advantages of silicon besides those found in company PR texts…As far as I can tell, the advantages are purely industrial for the production of lots of cheap and identical springs. Modern processes becoming more practical, so we can depend on this technology for future generations ? Sure….That’s why the USA buys floppy disc drives on the ‘Bay to keep our nuclear arsenal at the ready, and playing an 8-track has now become a lost art form. An interesting article but with some problems. The remark about brass, just under the picture of the cut balance doesn’t make sense but the author clearly understands how the system works. On the silicon story however: I understand that the springs are plasma etched from slices cut from a mono-crystalline silicon boule. The surface is then oxidized to make the silicon/silicon dioxide complex thermally neutral. It is hard to imagine that such a material could ever be produced by 3D printing. The silicon source material is widely, and cheaply, available because of its use in micro electronics. If this technology changes the watch industry could be in trouble. Though given its enormous margins it may be able to set up its own source. I could imagine this production process very well being taken over by a 3D printing-style process somewhere in the future! The industry is trying very hard to make us believe it is harder to make silicon components than it is, which is why the manufacturers can still command high prices for it. Sooner or later, those prices will come down (much like transistors did) as more suppliers in Switzerland emerge and the fight for business becomes more competitive. My apologies, Tim, I should have stated that the brass on the outside of the balance expands more than steel if the temperature increases and vice versa when temperature decreases. I hope you enjoyed the article. Thanks, Ashton. Of course you knew all that. As a fellow writer I know how easy it is to overlook a slip. If Syloxi is technically better in every way (including isochronism), why didn’t Rolex introduce them with the Caliber 32XX even until now? Again, if silicon hairsprings despite being flat, are so good in terms of isochronism, why did Breguet come up with an “overcoil” (albeit a modular type) silicon hairspring? The purpose of the Breguet over coil can be achieved in a flat silicon spring because the thickness and therefore behaviour of the spring can vary along its length. This was first done I believe by Patek Philippe. Breguet added a – completely useless – overcoil to a silicon hairspring because it is a “Breguet overcoil”. This was hesitatingly confirmed to me after I insisted on a technical explanation. The overcoil is so firmly connected with A.L. Breguet that the company bearing his name did not want to delete it in their newest achievement. I’m afraid you will have to ask Rolex as to why they do and do not do certain things. My article is merely an opinion on whether Rolex will continue to use silicon in their watches.